This Veterans Day, Dunkin’ will once again say thank you to those who serve by offering a FREE Donut to All Veterans and Active Duty Military at Dunkin Donuts. 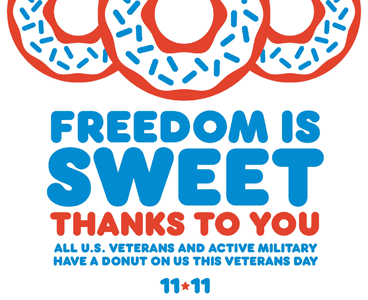 On Sunday, November 11, anyone who shows a military ID at participating Dunkin’ locations nationwide will receive a free donut of their choice with no purchase necessary, while supplies last. Limit on per customer. * No purchase necessary. While supplies last. Limit one per customer. Offer available in-store only. Not available for orders placed using On-the-Go Mobile Ordering through the Dunkin’ Mobile App. Also you can submit the name of a deployed member of the United States armed forces. Dunkin’ will surprise some of these members with a case of the brand’s ground Original Blend Coffee.